PokerNews India met Nikita Luther, the superwoman of Indian poker. 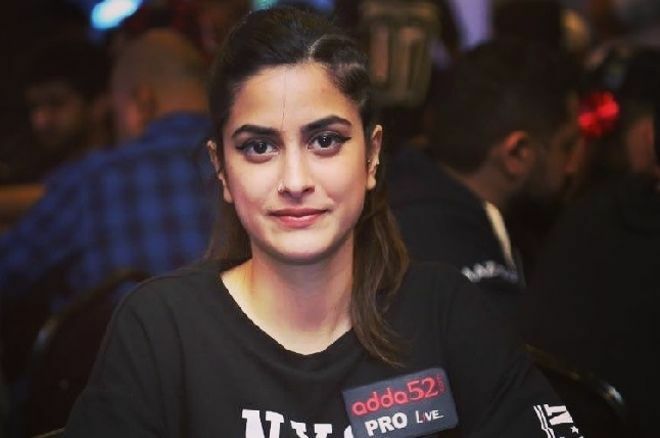 She’s one of the most recognized faces on the poker circuit and the sole Indian woman with a WSOP bracelet to her name. For the uninitiated or those not keeping track, she's the only woman in 2018 to win a WSOP bracelet! Imagine that. What a proud moment for India. PokerNews India: Tell me a bit about your background. Nikita Luther: I’m from Delhi and have a defense background; my father was in the Air Force. I did my schooling from Sanskriti School and then completed my Bachelor’s degree from Delhi University. Currently, I’m pursuing Post-graduation. I’ve had a very adventurous childhood and as a family, we loved traveling, camping, fishing, adventure sports etc. I still love doing all those things; being out in nature is one of my favorite things to do. PokerNews India: How did you get into poker? Nikita Luther: I was introduced to poker at a friend’s birthday and it became a fun hobby for me. It turned into a passion soon and has now become my profession. I’ve been playing poker for the past 10 years now and professional tournaments for the last 2.5 years. PokerNews India: Tell me about your WSOP journey and the bracelet win. Nikita Luther: Words can’t do justice to describe what it is to experience a WSOP win. I remember when I started out in poker, I watched endless hours of WSOP on YouTube and fantasized about playing at the World Series Of Poker someday, let alone winning a Bracelet. The entire WSOP experience has been magical. The halls at the Rio are electrifying with the sound of intensity and riffling chips. I’ve been really fortunate to have done well both the years I have gone there. Last year, I made some deep runs with the highlight being final tabling at the WPT Aria with the chip lead. This year, the highlight of course, was bringing the bracelet home to India. That being said, I feel equally proud to make final two tables of the $3k event which is arguably one of the toughest WSOP events. PokerNews India: Besides playing poker, what all do you do? Nikita Luther: I was approached to launch the Poker Sports League in 2016 where I served as the COO in its first two seasons. That was a full-time commitment and looking back, I am shocked at how I managed to continue playing poker on the side and put in all those hours studying the game. Of course, credit goes to Anuj Gupta and Pranav Bagai as they fully supported me and helped me somehow balance these two full-time jobs. PokerNews India: What resources would you suggest to newbies who are just starting out in poker? Nikita Luther: Run It Once. That’s where I started. It’s a goldmine for beginners. PokerNews India: What’s your training regime? Nikita Luther: I put a lot of work into my game. In fact, I think I put in more work studying the game than actually playing it! It’s probably not a good thing because practice makes perfect. Some of the tools I use to train are taking personal coaching, consuming video content, studying online courses, recording and analyzing my hand histories, working on solver tools and talking to other more experienced players. I don’t read books as they tend to get outdated soon; given that poker is a constantly evolving game. PokerNews India: Tell me about your social media channels. Nikita Luther: I’m not very active on social media. I feel it is a massive waste of my time. Though, I will try to be better at it this year. My handle is @nikitaluther on both Twitter and Instagram, and @nikitalutherofficial on Facebook. PokerNews India: What’s your most cherished poker memory besides the WSOP win? Nikita Luther: Each of my 3 titles made me feel on top of the world. Aside from that, If I had to pick one, it would be finishing 5th at WPT Aria. PokerNews India: Do you have a favorite starting hand besides the obvious Aces? Nikita Luther: This question has made me realize that I haven’t even ever thought of it. How sad! I should have a favorite hand, I don’t though (laughs). PokerNews India: What has been your ultimate ‘tilt’ moment? Nikita Luther: Not getting GPI points for the WSOP Tag Team event. Just kidding. I think it was recently at the APT Vietnam Main Event. I was the chip leader in the main event at end of Day 1 and Day 2. I maintained the chip lead almost all of day 3 as well. I played my absolute A-game and suddenly with 3 tables left I was on the wrong side of coolers twice and then went card dead. It was a super deep, slow structure and I haven’t experienced such mental exhaustion before. After being card dead for hours I hung onto my stack which was now shortest with 11 players left. 10 was the virtual final table. I took a spot where the chip leader opened from cut-off (who was opening every hand as he should on the FT bubble), I look down at on the button with 18 big blinds and jammed to steal the pot thinking I’m blocking and . It’s not the worst, but I could’ve waited for a better spot. That was real pain since I gave it my all, had the chip lead for 3 days and I like to believe had an edge over most of the remaining field. I recall walking out devastated, not being able to speak. PokerNews India: Who’s your favorite poker player? Both International and Indian. Nikita Luther: I like Steffan Sontheimer. I have an aggro playing style and he is one of the best at that. He thinks of the game on a different level altogether which really inspires me. In India, I think Sriharsha Doddapaneni is great. He has an innovative approach and is unpredictable. Would be interesting to see how he fares if he travels more on the live circuit. PokerNews India: Do you think there is a divide between women and men poker players in India? Nikita Luther: Yes definitely, there are barely any women players. Women don’t seem to be inclined to take up the mind sport seriously. But when they do, there’s enough opportunity. The environment is friendly and welcoming. In my experience, I have come across mostly decent people in poker and personally haven’t felt uncomfortable at a single poker game in the 10-odd years that I have been playing. PokerNews India: What are your plans to promote poker among women in India? Nikita Luther: It is my hope that if I continue to put in sincere effort into my game and continue to achieve results; I will be able to inspire women to consider taking up the game. Here’s my message to all the women who want to take up poker seriously – Feel free to get in touch with me. I would be happy to help you in any way and guide you in the right direction.